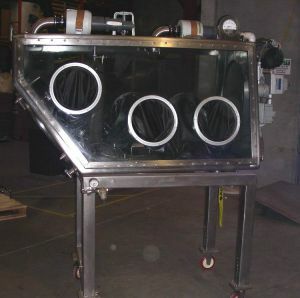 Product Description This Walker Stainless portable controlled atmosphere glove box has six 10" ports. Heavy gauge stainless steel construction with tempered glass will allow for positive & negative pressure applications. 20" access port on bottom of glove box with stainless steel cover. 20" access port on the end with plexiglass cover and 2 small drain valves. 2 HEPA filter assemblies on top of the unit for in & out. 1/2 HP motor for heavy circulation. Adjustable triangular convex mirror inside the glove box at the top can be adjusted by control outside for full viewing of inside chamber. Explosion proof electrical components (transformer, switch etc). To have a glove box made like this today would cost $150K. Gloves are not included: New gloves will need to be ordered separately at additional cost.